Mischievous and resolved, courageous to the point of recklessness, Anakin Skywalker has come of age in a time of great upheaval. The nineteen-year-old apprentice to Obi-Wan Kenobi is an enigma to the Jedi Council, and a challenge to his Jedi Master. Time has not dulled Anakin's ambition, nor has his Jedi training tamed his independent streak. When an attempt on Senator Padmé Amidala's life brings them together for the first time in ten years, it is clear that time also has not dulled Anakin's intense feelings for the beautiful diplomat. The attack on Senator Amidala just before a crucial vote thrusts the Republic even closer to the edge of disaster. Masters Yoda and Mace Windu sense enormous unease. The dark side is growing, clouding the Jedi's perception of the events. Unbeknownst to the Jedi, a slow rumble is building into the roar of thousands of soldiers readying for battle. But even as the Republic falters around them, Anakin and Padmé find a connection so intense that all else begins to fall away. Anakin will lose himself--and his way--in emotions a Jedi, sworn to hold allegiance only to the Order, is forbidden to have. 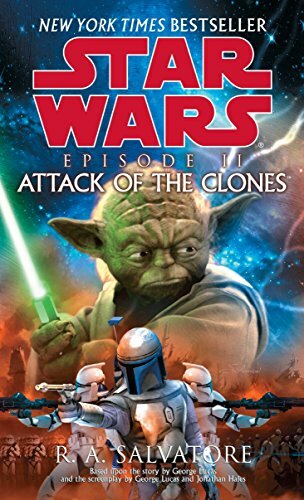 Based on the story by George Lucas and the screenplay by George Lucas and Jonathan Hales, this intense and revealing novel by bestselling author R. A. Salvatore sheds new light on the legend of Star Wars--and skillfully illuminates one of our most beloved sagas.